recoveries of these 8270 compounds. Teresa Tam and Jay Gandhi, Ph.D. The webinar will discuss methods for assay of perchlorate, bromide and bromate at ppb concentration in drinking water. Editor of Separation Science; International Scientific Communications, Inc. 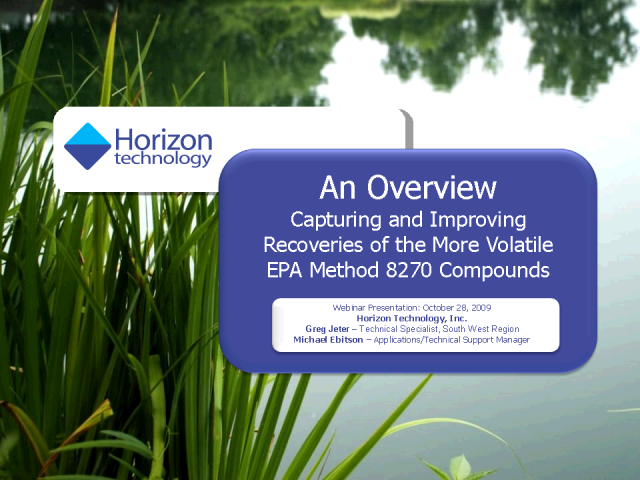 Complying with the modifications to EPA Method 1664A using Horizon Technology automated extraction systems. Ronald Breuer, Business Development Manger, BINDER Inc. The use of environmental chambers for conducting product shelf life and stability testing, including applications that require the ability to control temperature and humidity. Ron Breuer of BINDER Inc. will be presenting an informative presentation on stability and shelf life testing as well as static temperature and humidity testing for products in an environmental chamber. We will look at some of the current regulations for stability testing of pharmaceuticals as well as the options to comply with them. There will be information on other applications where testing requires the ability to control temperature and humidity. ISC is a practical resource for analytical chemistry and life science laboratory solutions; instrumentation news, new products, application notes, and latest industry news.